Why does the Solano Sleekheat450 Professional Flat Iron Work So Well When it comes to Straightening Curly Hair? Are you sick and tired of having problems when you go to straighten your curly hair? Maybe you are in need of a serious upgrade to the flat iron you are trying to straighten your hair with. One such flat iron that many stylists say works great on curly hair is the Solano Sleekheat450 Professional Flat Iron. When a hair styling tool is recommended by professional stylists you better believe it gets our attention. That is why we decided to do a more in-depth review of the Solano Sleekheat450 Professional Flat Iron. You don’t get much better performing flat irons than this one. The Solano Sleekheat450 Professional Flat Iron just has so many great features. Among them is its large variety of heat settings (170°F to 450°F) and its far infrared heat generation. 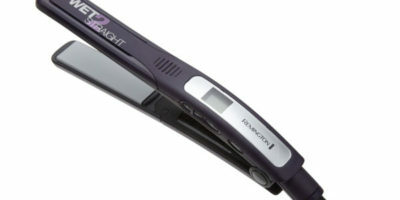 This flat iron also features a 1” heater plate width which gives you many options when using it. It can be used as a hair straightener, hair curler or even used to change your curly hair shape into softer and looser waves. The heat plates on it are ceramic coated and tourmaline crystal infused. These things mean it’s a flat iron that will heat up rapidly and stay hot during your curly hair straightening process. It will also help your curly hair retain more moisture and help prevent bothersome frizz. This flat iron is safe and easy to use thanks to such features as its rounded edge design and its stay cool tips. Even if you touch one of its 4-sided beveled edges against your scalp while straightening your hair it won’t burn you. We really liked the fact it had an extra-long 9-foot power cord too. That means it will not restrict your movement as you are using it to straighten your curly hair. Despite its numerous features it only weighs 12 ounces too. The large amount of temperature settings really are great to have when straightening curly hair. With heat settings from 170°F to 450°F, anybody can find a heat setting that straightens their hair effectively and does so without overdrying it. 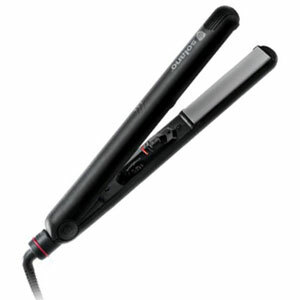 Another great asset this flat iron has when it comes to straightening curly hair is its far infrared heat generation. Far infrared heat penetrates deep inside your hair strands to loosen them up so they can be straightened easier. It’s also very gentle on your curly hair too because of the way it heats your hair from the inside out. We found the warranty that comes with this to be average or worse for a flat iron that is sold in its price range. It only comes with a 2-year warranty period. We had a few concerns with this product too. Although it has a good range of heat settings it has no digital readout so you can see exactly what temperature this hair straightening device is at. The fact it does not come with an automatic shutoff feature is a little surprising also. Solano should definitely think about adding this feature into future models. There really is a lot to like about this flat iron from Solano. It has a huge range of temperature settings and will nicely straighten any type of curly hair you have. 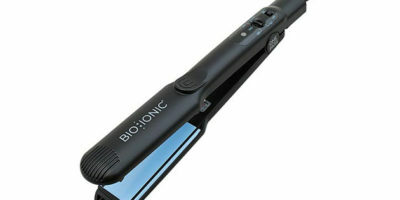 Its ceramic/tourmaline technology produces even heat and even protects your hair some as you straighten it. The 1” wide heater plates it has are versatile and allow you to curl and add waves with this straightening iron too. The Solano Sleekheat450 Professional is definitely a top of the line hair straightener for curly hair.